"It will be a really sad thing to shut down St. Louis' time and temperature; I've had people tell me they often called the number late at night in the 1980's and 90's and even 2000's as a teenager so their boyfriend or girlfriend could call while they listened to our service over and over on the other line AND THEN would click through to their boyfriend with call-waiting on the other line so the phone wouldn't ring and wake their parents. There is a lot of history here"
The number of calls to St. Louis' free time and temperature service is falling. No, it's not the mild Summer weather in St. Louis this year, but rather the free and easily accessible weather information on the growing number of smart phones. Attorney Michael E. Carter, the operator of Time And Temperature, said that "we used to get over 500,000 calls per month, but that is steadily decreasing to where we are lucky if we get 250,000 calls in a month and many many of them are repeat calls. I watch it closely because our law firm advertising on the service is directly impacted." 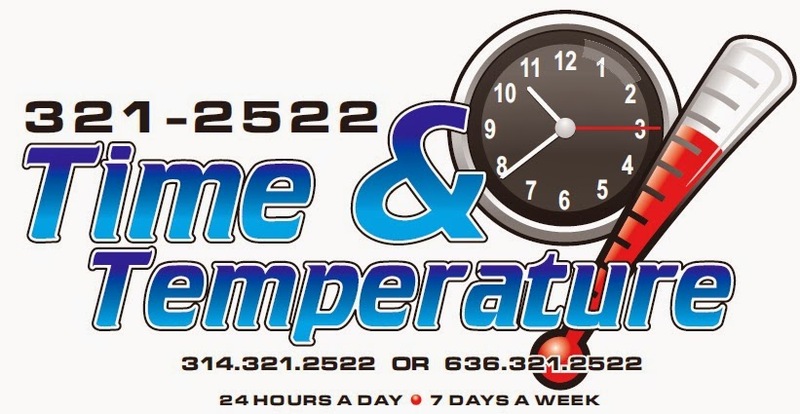 The free time and temperature service has been around since the 1930's when people originally dialed FA1-2522. Since then, a line of several banks took over the service until August 2002 when Bank of America turned it off because it wasn't part of their marketing mix. Then, in 2005, then Senior Lecturer Michael E. Carter's UMSL marketing class looked into re-establishing the line and was able to procure the old phone numer which Southwestern Bell had said was a "retired number." "It had been three or so years since Bank of America turned it off, but when we plugged in three or four phones and the 321-2522 number went live; low and behold, it started ringing instantly and constantly. I guess people still dialed the number out of habit. It started at like 300 a day right away and then quickly climbed into the 1000's and around daylight savings time and during other weather-related events it would climb to 30,000 and even 40,000 calls a day," said Carter. In recent years Carter says the call count has continuously went down. Nearly every smart phone has the weather incorporated into the phone's services. He also noted that more and more vehicles have outside temperature indicators in the cabin. Carter said "it is really a sad thing to shut down St. Louis' time and temperature; I've had people tell me they often called the number late at night in the 1980's and 90's and even 2000's as a teenager so their boyfriend or girlfriend could call while they listened to our service over and over on the other line AND THEN would click through to their boyfriend with call-waiting on the other line so the phone wouldn't ring and wake their parents. There is a lot of history here"
Amendment 7 is a ¾ cent sales tax which will appear on the August 5thballot. Carter said he believes the public should be free to make up its own mind on the issue without public resources being used to persuade them. "If this construction-type signage is being done by MoDot, we must remember that those signs belong both to people who support this tax increase and also to those people who don’t support the issue. It is unfair to use the money and resources given collectively to support public improvements and services to be used for political advocacy,” stated Carter. He further added that if these are construction-company-owned signs, they should not be using universally accepted governmental traffic construction type signs to promote tax increases under the color of traffic control authority. Carter also pointed out that MoDOT routinely has to take down the signs of politicians and individuals who put up signs on the public rights of way. “To turn around and then put up their own version of a campaign sign (or allow them) on the public right of way, using public equipment, and public employees would be cause for great concern." Mike Carter is an independent minded citizen attorney who values freedom from governmental intrusion above nearly all else.